Jasmine Tea	There are	4 products. 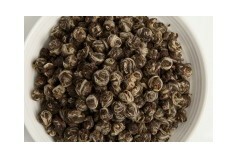 Jasmine tea is honored as the most fragrant and popular scented Chinese tea in the world. This tea is light, delicate, slightly sweet and every cup comes with a distinctive fresh jasmine fragrance. The strong flowery aroma of this tea is very soothing. Smooth green tea with a rich jasmine bouquet, these beautiful pearls are rolled from the tender shoots of tea leaves and buds to unfold the rich and smooth sweet floral flavor. Watch the pearls unfurl and let the aroma of sweet jasmine awaken your senses. The jasmine flavor fills your cup even after several steepings. Taste the difference of superior grade!